Idigbo is native to West Africa. Pale yellow /brown in colour although can vary due to where it has been cut out of the log. It is relatively durable for external use, although will need to be treated or painted. From our experience using this timber, it machines, glues and takes fixing well although if the timber gets wet the acidic properties can corrode metal. 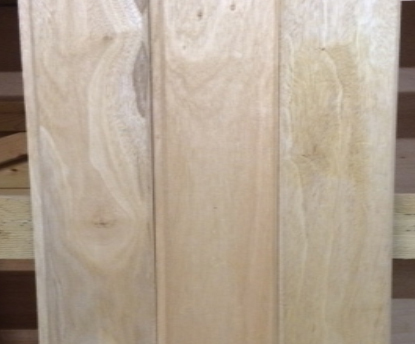 We predominately use this timber in the manufacture of our wooden garage doors . It can be used for wooden gates however we would really recommend using Iroko hardwood. Photo’s can be viewed of wooden garage doors we have produced in Idigbo hardwood within our made to measure wooden garage door section links below.